Prague is one of my cities on my 'must-visit' visit. Weirdly, after living in UK for more than a decade, I never got my "derrière" (Pardon my french) to visit Prague even though it is only a 2 hour flight away. I finally only got to visit this magical city of bridges, cathedrals and gold-tipped towers after I have moved to Singapore. Fret no more as at least I got to visit this amazing capital city of the Czech Republic. We stayed at a newly opened hotel called Jurys Inn which is located in a convenient spot for the Prague Old Town. It has the Florenc Metro across the road and a tram stop right in front of it. We spent two lovely nights there and paid only SGD$100 per night for the room and somehow the rate was for a triple room. We landed in Prague in the late afternoon and wanted to take in some sights of Prague in the evening. We have decided to engage a guide service to help appreciate Prague in more depth since we only had 2 days in Prague. The best part was it didn't cost us an arm and a leg. We used Alena's services, and if you are visiting Prague, I would definitely recommending using a private guide service. You can learn and see so much more on your trips. Our guide, Alena even gave us a great recommendation on where to go for our first dinner in Prague - Prague Cafe Imperial which was right down the road from our hote. We had to have our dinner early to meet Alena on our night tour of Prague, thus we didn't have the chance to take photos of the wonderful food we had. Our tour started with Alena taking us on the Tram which costs like CZK24 (SGD$1.60). The ticket is valid for 30 minutes. If you are going to take more than 4 trips, a 24 hour ticket may be more worth it at CZK110 (SGD$7.30). We first went for a walk through Wenceslas Square, which is one of the main city squares in Prague. It was the centerstage of many historical events from demonstrations to celebrations. This was the place where on 16th January 1969, a student named Jan Palach set himself on fire to protest the invasion of Czechoslovakia by the Soviet Union in 1968. The other notable demonstration was during 1989, the velvet demonstration. Wenceslas Square has two landmarks situated on it. One at the Southeast, uphill end is the National Museum Building and the other is statue of Wenceslas. 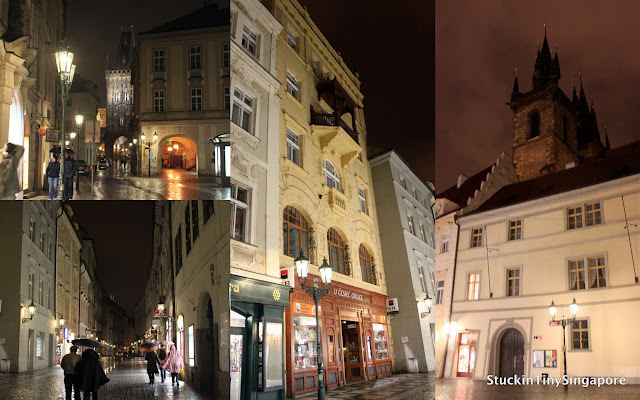 We continued our walk into the Old Town which is Prague's historic center. It was so pretty at night. We walked past the Estate Theatre which was where Mozart's opera Don Giovanni was first performed. There was also the Old Town Square where there was some market going on. 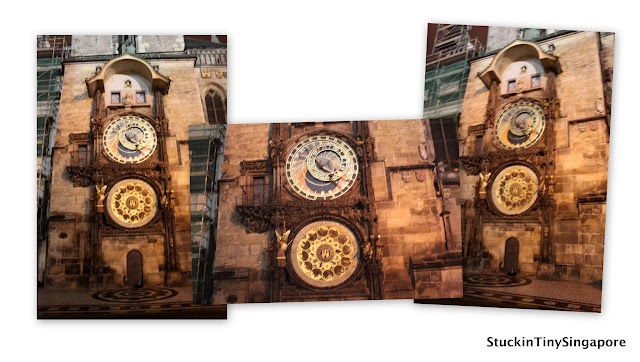 Standing in the square is the Old Town Hall where on its Southern wall, you can find its famed Astronomical Clock. The clock was made in 1410, the oldest one still functioning. At every hour the clock will put on a minute show of figures of the Apostles and also the Skeleton which represents Death, striking the time. The clock also shows the position of the Sun and the Moon and various astronomical details. You are also allowed to climb up the Old Town Hall's 60m tall tower and have a bird's eye view of the Old Town Square and the surrounding. One of the other landmarks there is the Church of Our Lady Týn, which you can see really well from the Old Town Hall's tower. The church towers are 80m in height and topped by four spires. View of the Old Town Square with the Old Town Hall on the left and Church of the Lady Tyn on the right. We concluded our night walk with a stroll across the town towards the Vltava river crossing the Charles bridge looking over to Prague Castle which we would be visiting the next day. Unfortunately the Charles bridge wasn't well-lit, so didn't really take any photos of it. That is all for now. In part 2, I will have more on the trip to Prague. Ciao for now. Thanks Carole. Love your bucket list. Been to Santorini and the Amalfi Coast last year. Will be writing about them later. The church you show as "Church of Lady Tyn" is actually St Nicholas Church [northwest corner of Staromestke Namesti, the Church of out Lady before Tyn is on the eastern side of Staromestke Namesti. Also the Charles Bridge crosses the Vltava river.